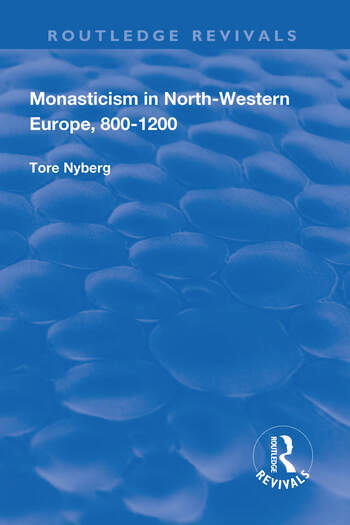 This title was first published in 2000: This is a full-scale integrated synthesis of the origins, spread and effects of monasticism in Scandinavia, and along the shores of the Baltic and the North Sea. Beginning with a review of the geography and communications by land and, especially, by sea, of the region, Nyberg goes on to describe early monasticism among the Frisians ,Saxons and the Danes, then in Norway and Sweden, Saxony, Slesvig and Ribe, and finally Pomerania and the southern and eastern Baltic littoral. Throughout the book he stresses the place of abbeys and convents within their local surroundings, as centres of conversion, recruitment and redistribution of wealth. He traces the intellectual, literary and liturgical connections between monastic centres and neighbouring cathedral towns and royal strongholds, and the means by which orders or congregations maintained discipline from the centre. He also describes the leaders who emerged from convent, abbey or congregation to command local and regional political and cultural life, and the ways in which monastic centres influenced popular devotion. Contents: Introduction; The monastic geography of North-Western Europe: The regions; Communications; Early monasticism among Frisians and Saxons: The Frisians; The Saxons; The archbishops’ options; Eleventh-century monasticism: Eastern Denmark: The period 1020-1100; Zealand and the diocese of Roskilde; The two Scania dioceses; Eleventh-century monasticism: Funen and Jutland: Funen and the diocese of Odense; The three new dioceses of Jutland; Eleventh-century monasticism: Norway and Sweden: Norway; Sweden; Eleventh-century monasticism: Saxony, Slesvig, Ribe; The great period: civil war I: The spirit of the epoch: revenge and penitence; The alternative: disinterested prayer; The great period: civil war II: Monasticism in times of threat; The Danish model in Sweden; The Danish model in Norway? ; The great period: civil war III; The Valdemarian age I: 1157 and the coming of competition: Summing up: kings in the secular church and the monasteries; Bishops and monasteries; The new interpretation: peace and tension; Danish kingship and the new interpretation; Swedish kingship and monasticism; The Valdemarian age 2: movements among monks: The history of ’The Precious Island; ’ Repeated patterns? ; New moves in Sweden; Women and the monastic option; The Valdemarian age 3: sons and daughters of St. Augustine; The Valdemarian age 4: peripheria and conclusion: Among the Obodrites and Pomeranians; Among the Frisians; Conclusion; Appendix: development of Cistercian foundations in Denmark; Bibliography; Index.